If you've ever measured sag before, you may have noticed that if you check it three or four times, you can get three or four different numbers without changing anything. We'll tell you why this occurs and how to handle it. stiction. Therefore L2 and L3 must be averaged and subtracted from L1 to calculate true spring sag: static spring sag = L1 - [(L2 + L3) / 2]. Step 5: To adjust sag use the preload adjusters, if available, or vary the length of the preload spacers inside the fork. Street bikes run between 25 and 33 percent of their total travel, which equates to 30 to 35mm. Roadrace bikes usually run between 25 and 30mm. 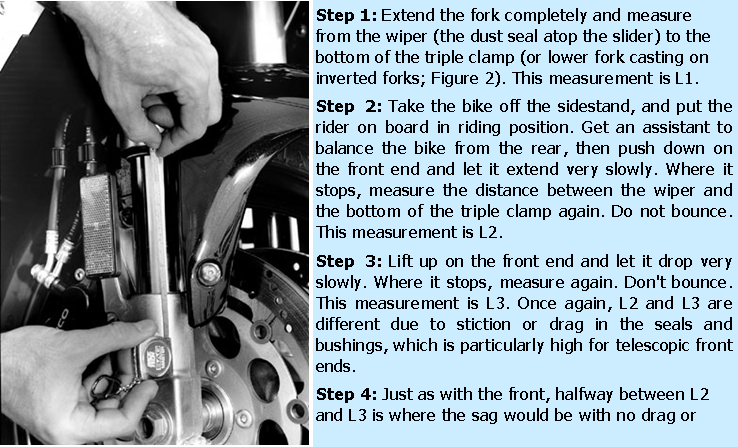 This method of checking sag and taking stiction into account also allows you to check the drag of the linkage and seals. It follows that the greater the difference between the measurements (pushing down and pulling up), the worse the stiction. A good linkage (rear sag) has less than 3mm (0.12") difference, and a bad one has more than 10mm (0.39"). Good forks have less than 15mm difference, and we've seen forks with more than 50mm. (Gee, I wonder why they're harsh?). Using different sag front and rear will have a huge effect on steering characteristics. More sag on the front or less sag on the rear will make the bike turn more quickly. 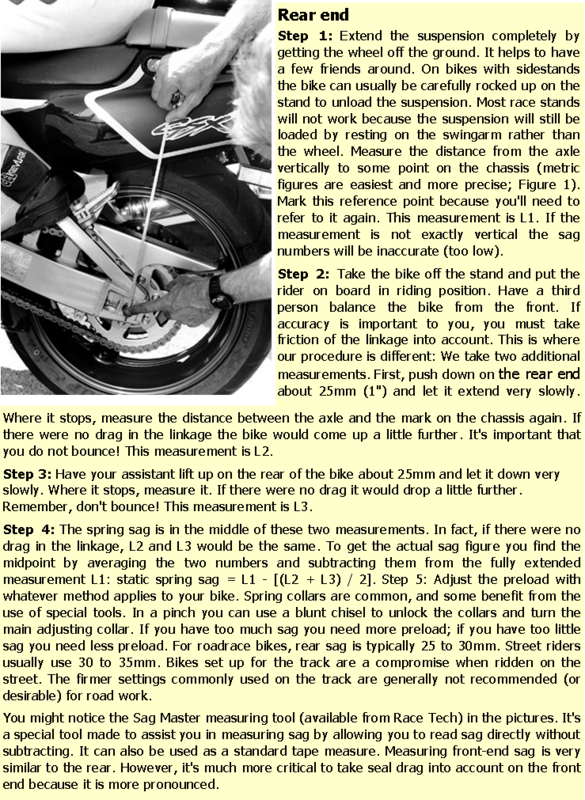 Less sag on the front or more sag on the rear will make the bike turn more slowly. Increasing sag will also decrease bottoming resistance, though spring rate has a bigger effect than sag. Racers often use less sag to keep the bike higher off the ground for more ground clearance, and since roadracers work with braking and steering forces greater than we see on the street, they require a stiffer setup.